Prabhakar's page: Secrets of a watermelon!!!!!!!!!!!! High temperatures, scorching sun and ruthless hot winds... I was melting like the fuming lava of a volcano this summers and I desired to be chilly in this crazy heat. Well! It is challenging to be cool in this heat... though not impossible. I needed an icy break, I took one with a voluptuous water-melon... it cooled me within and left it’s impressions outside... a refreshed soul and a flawless and vibrant exterior self. It doesn’t take much... just buy a luscious watermelon from the market... store it in a refrigerator for sometime to later cut into two halves and enjoy its fruity and juicy flesh... I felt heavenly... fresh and lovely. A slice of watermelon is absolutely striking... looks like the kuku flower in bloom... 92 percent water... with many vitamins and minerals, contains more of vitamin C and vitamin A and minerals such as potassium and magnesium. It is from the deserts of southern Africa but has become very cosmopolitan... has moved to all parts of the world, Chinese enjoy it in the form of a pickle though some others enjoy it as steaks, grilled watermelon. I prefer it raw and fresh, mostly a slice of it or for a change watermelon juice with some masala is awesome even a smoothie is fine. It is a big support system for summers... I think you will agree. I never realized that I munched its seeds while gulping the flesh, no worries as I found out that it is a favorite snack for many watermelon lovers and in many communities it is believed to be a delicacy... doctors say it is rich in fat and protein. Watermelon is seen in a lot of art works... ceramics display a lot of watermelon and Mexican still life art uses a lot of watermelon... so it has inspired the artist community too. It is celebrated as the official state vegetable of the Oklahoma State... Melon! 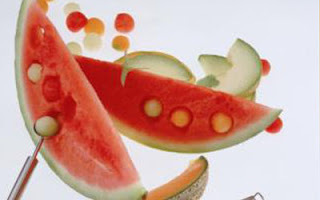 Melon...Watermelon you are all over this summers.